With this kit, students can see more than 20 different interference patterns and observe the limits of resolution at different wavelengths. It includes two unique 8 x 10 cm slides. The slitfilm contains 21 different slit patterns featuring a range of slit widths, spacing, and multiples for generating different diffraction patterns. The other set of slides has five bands of progressively narrower and denser slit patterns for testing the limits of resolution. Each film is mounted in a glass case to protect it from scratches. 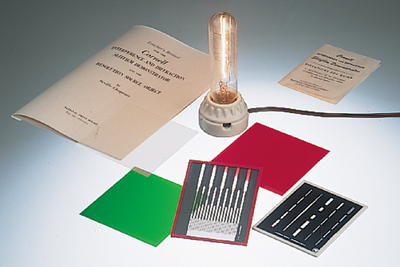 Ordering information: This kit includes a 40W straight filament bulb; a table top socket and plug; three filters, red, green and frosted, and complete instructions in a 28-page manual.